The presidential candidate of Venezuela’s coalition of opposition parties, Henrique Capriles, hosted a rally on June 10 to formally initiate his campaign against President Hugo Chávez. “Hundreds of thousands” of Venezuelans—according to Reuters, the Associated Press, and The Miami Herald—flooded the streets of downtown Caracas to support his candidacy. The “good looks of the bachelor candidate” helped attract a huge crowd to the event in which Capriles walked or jogged six miles to register with electoral authorities, “burnishing his image of physical fitness,” per Reuters’s account. He “exuded youthful energy,” said the AP, and had won praise for being an “energetic and dedicated leader” as the governor of Miranda State, according to The Miami Herald. Censure for Chávez has so thoroughly permeated Venezuela’s body politic, apparently, that even communists oppose him: “Chávez was the great hope for our cause, but we’ve given up on him because he has turned his back on the people even as he claims to be the voice of the people,” The Miami Herald quoted the secretary general of the Bandera Roja (Red Flag) Party as saying. 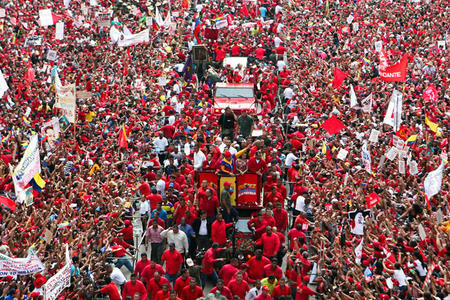 So it came as no surprise that just one day later, the U.S. press reported that Chávez’s own rally to officially inaugurate his presidential campaign attracted a crowd an entire order of magnitude smaller than that of Capriles. 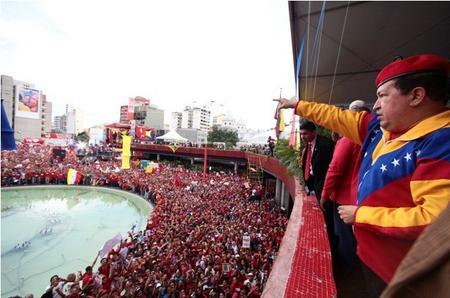 The AP’s headline, “Chavez rallies thousands launching re-election bid”—a figure also used by NPR and the Los Angeles Times—implied that the number of pro-Chávez participants could have been anywhere between 20 to 500 times smaller than the number present at the previous day’s pro-Capriles rally. The AP’s Fabiola Sanchez cited a higher estimate of “tens of thousands” in the body of her piece, but even this number (also used by The Miami Herald) amounts to just a fraction of Capriles’s “hundreds of thousands” of supporters. Hundreds of buses that ferried his followers to Caracas stood parked in side streets. . . . Critics accuse Chavez allies of using state resources to swell demonstrations and forcing government employees to attend. 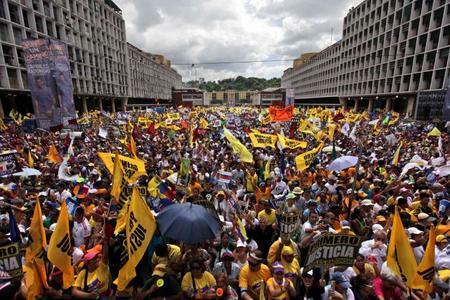 Opposition leader Leopoldo Lopez said the ruling Socialist Party had ordered ministries to help bring 120,000 people to the march, citing what he called an internal party document. Ellsworth’s article also failed to include any estimate of the number of participants at Chávez’s rally, despite a widely-distributed Spanish-language dispatch by Reuters itself, which stated in its first paragraph that Chávez was “accompanied by hundreds of thousands of sympathizers.” Although the Spanish news website Público.es and Britain’s The Guardian corroborated this estimate, no major U.S.-based news source used it to describe the number of participants in Chávez’s rally. At times, Capriles deviates from this persona, as when he referred to poll numbers—many of which consistently show Chávez leading by double-digit margins—as the work of “immoral mafiosos,” according to Reuters. More importantly, his political record betrays far-right tendencies that contradict his inclusive, conciliatory image. As the BBC notes, Capriles “was involved with a group of other young politicians in setting up in 2000 a new opposition party Primero Justicia.” In the lead-up to the 2002 coup d’etat against Chávez, which killed dozens, Primero Justicia indirectly received hundreds of thousands of dollars and training from a foreign government—in this case, the United States, through the National Endowment for Democracy, an agency largely financed by Congress. Leopoldo López and Leopoldo Martinez, two of Primero Justicia’s other top leaders, went on to play key roles in the 2002 coup government of Venezuelan business magnate Pedro Carmona. López—who Reuters deemed fit to comment on the supposedly authoritarian nature of last week's pro-Chávez rally—himself signed on to Carmona's 2002 decree to abolish the General Assembly, the Supreme Court, and the Constitution. A leader seeking reelection with a track record of spearheading the policies listed above can surely afford some bravado on the campaign trail.